Penterra™ is effective soil penetrant and soil surfactant product for addressing hydrophobic profiles and horizons. Penterra keeps soils from locking up, aggregates clay soils, aggregates soil, improves soil structure and allows water and oxygen to better reach plant roots by reducing the surface tension between the water and the soil. Penterra assists fertilizers and plants by increasing plant nutrient uptake and keeping the soil aerobic by increasing the amount of oxygen exchanged with the soil profile. Penterra is designed to decrease the surface tension between water, soil and plant while improving the growth and activity of aerobic micro-organisms necessary for a healthy soil profile environment. Best of all, it is so easy to use and its beneficial secondary effects to LDS (Localized Dry Spot) are noticed rapidly. Not only are you improving the soil, but you are adding a long term soil management to the turf and plants to make them healthier, and increase its disease and insect tolerance. 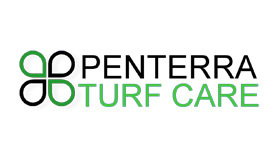 Penterra is important tool for Golf Course Superintendents, Landscapers, Lawn Maintenance, Gardeners, Horticulturalists, and Land Management companies.